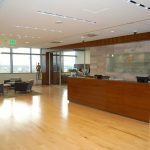 Howell Construction, as design-assist partner with BURKETTeau, built out the new executive office space from existing core and shell construction. The project, located in the heart of downtown Denver, has energy saving systems to include high-efficiency HVAC systems and complex lighting controls to maximize daylight for energy savings and occupant comfort. All aspects of the project are green-friendly and have been designed to achieve LEED® Certification. Interior finishes are top notch, including maple hardwood floors, custom cherry wall/ceiling wood paneling, NanaWall conference room wall system, and an 8-foot water wall in the reception room. 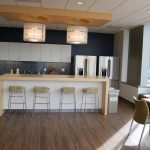 The work also included a full floor build-out for First Western’s operations center. 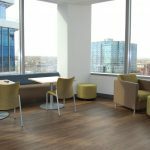 The facility has the same features as the Executive Floor, but utilized DIRTT modular wall systems to allow for future reconfigurations.